"Buildings - Schools - Universities and Colleges"
52 records – page 1 of 2. This portion of the interview is about Dr. Evenden’s description of the Simon Fraser University campus after it opened in 1965. Dr. Evenden and Dr. Seager talk about aspects of how the university site was chosen, its impact on the local community, and events in 1967-1969 that affected town & gown relations. Recording is of an interview with Dr. Leonard Evenden and Dr. Allen Seager conducted by Kathy Bossort. Leonard Evenden and Allen Seager were two of 23 participants interviewed as part of the Community Heritage Commission’s Burnaby Mountain Oral History Project. 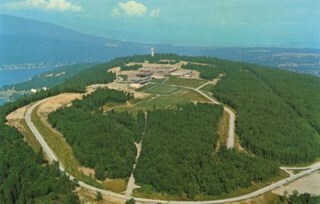 The interview is mainly about aspects of Simon Fraser University’s history that is related to its site on Burnaby Mountain, as told by two retired SFU professors, Dr. Evenden of the Geography Department and Dr. Seager of the Department of History. The interview ranges over campus access and housing issues created by the isolated mountain site; the relationship of the university to the local community and the dispute over land ownership and control with the City of Burnaby; SFU’s environmental stewardship; the development of UniverCity; and the future of parkland in the conservation area on Burnaby Mountain. Dr. Leonard J. Evenden was born 1937 in Beijing, China, to parents and Salvation Army missionaries Leonard Evenden and Elsie Pearl March. Dr. Evenden attended McMaster University (B.A. 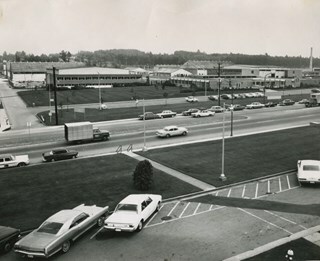 1960), University of Georgia (M.A. 1962) and University of Edinburgh (Ph.D. 1970). He was appointed to Simon Fraser University’s Department of Geography in 1966, shortly after SFU opened in the fall of 1965, and retired in 2002. Dr. Evenden’s research has focused on Canadian urban geography. He edited a collection of essays about Burnaby titled “Suburb of Happy Homes: Burnaby centennial themes” (1995), and directed “Voices of Burnaby”, an SFU/Burnaby Centennial Committee oral history project (1992). Dr. Evenden is married with three children. Dr. Allen Seager was born 1953 in Montreal, Quebec, to parents C.F.B. Seager and Evelyn DeGex Chesam. Dr. Seager is a retired Simon Fraser University professor, being a member of SFU’s Department of History from 1981 to 2014, and has current links with SFU as an instructor for Continuing Studies. His research interests include history of Canada and Western Canada, and labour and working class history, particularly in the coal mining and railway industries. Dr. Seager moved to Burnaby and the Montecito area in 1981 where he continues to live and enjoy the hiking trails on Burnaby Mountain and the amenities at SFU. Dr. Seager is a member of the Burnaby North NDP, and has volunteered with Scouts Canada and the Burnaby Centennial Committee. Kathy Bossort is a retired archivist living in Ladner, BC. She worked at the Delta Museum and Archives after graduating from SLAIS (UBC) in 2001 with Masters degrees in library science and archival studies. Kathy grew up in Calgary, Alberta, and, prior to this career change, she lived in the West Kootenays, earning her living as a cook for BC tourist lodges and work camps. She continues to be interested in oral histories as a way to fill the gaps in the written record and bring richer meaning to history. Recording is of an interview with Dr. Ronald James Baker conducted by Kathy Bossort. Ron Baker was one of 23 participants interviewed as part of the Community Heritage Commission’s Burnaby Mountain Oral History Project. The interview is mainly about the founding of Simon Fraser University from the perspective of SFU’s first faculty member and Director of Academic Planning, Ron Baker. Ron Baker talks about John B. Macdonald’s report on higher education in BC (1962) and how it lead to the provincial government’s decision to establish a new university and to put it in the Burnaby area. He tells stories about how the site on Burnaby Mountain was chosen; about the building of the campus; and about the challenges of planning the academic structure of the university. He also talks about the attraction of creating with little interference an institution trying out new ideas and tells stories about his working relationship with Gordon Shrum. He considers the problems created by building universities in out of the way places and the ideas such as UniverCity for dealing with SFU’s isolation. Ron Baker was born in London, England, in 1924, and served in the Royal Air Force during WW2. He emigrated to Canada in 1947 and studied at UBC where he obtained a BA degree (1951) and MA degree (1953) in English Language and Literature. He served on the faculty of the UBC English Department beginning as a lecturer in 1951 and advanced to positions of Assistant Professor (1958-63) and Associate Professor (1963-65). He was a contributor to John B. Macdonald’s 1962 report “Higher Education in British Columbia and a Plan for the Future”, and continued to make significant contributions to the establishment of the community college system in Canada throughout his career. In 1963 the newly established Simon Fraser University hired Ron as its first Director of Academic Planning, serving also as first head of SFU’s English Department. In 1969 Ron left SFU to become the first President of the University of Prince Edward Island, a position he held until 1978. In 1978 he was made an Officer of the Order of Canada for his contributions to higher education. Ron has contributed to many organizations, including serving as a member of the Board of Directors of the Association of Universities and Colleges of Canada, on Canada Council, and as President of Association of Atlantic Universities and the Association of Canadian University Teachers of English. In 1990 Ron Baker was asked by the government of BC to prepare a preliminary report on the establishment of the future UNBC in Prince George. Now retired Ron Baker lives in the Edmonds area of Burnaby. 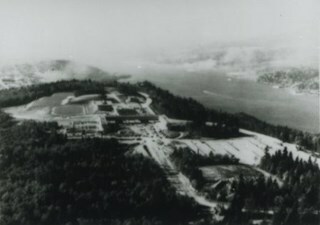 Aerial photograph of the Simon Fraser University (SFU) Burnaby campus under construction, facing west. 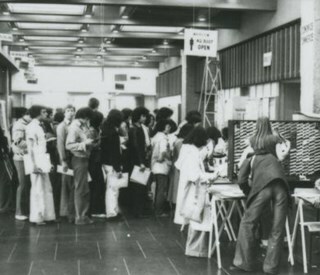 Photograph of Simon Fraser University (SFU) students in registration line-ups inside the university. 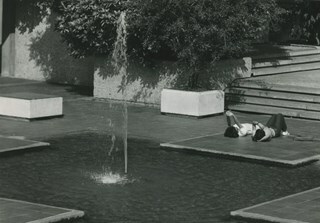 Photograph of Simon Fraser University students; Noel Chui and Priscilla Fong lying down beside an outdoor fountain at the university during the summer semester. Newspaper clipping attached to verso of photograph reads: "STUDENTS IDYLL ... Simon Fraser University campus can be a peaceful, quiet place in the summer. Students Noel Chui and Priscilla Fong relax in the sunshine by an outdoor fountain to escape the pressure of the summer trimester." Photograph of a Simon Fraser University student walking down the cement steps of the university in the rain. He is holding an open umbrella in one hand and a briefcase and notepad in the other. 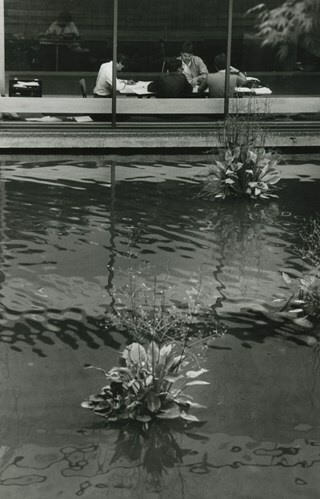 Photograph of the water feature at Simon Fraser University. Four students of the university are visible in the background, studying at a table together. 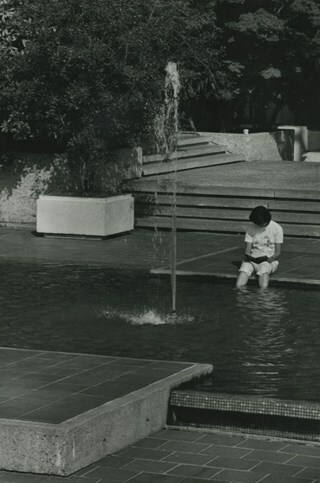 Photograph of Simon Fraser University student Noel Chui sitting with her feet dangling in an outdoor fountain at the university during the summer semester. Photograph of the British Columbia Institute of Technology campus. Photograph of the British Columbia Vocational School complex on Willingdon, next door to the British Columbia Institute of Technology. 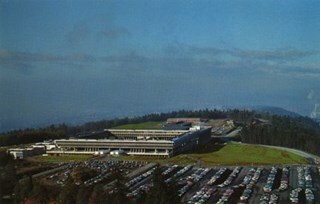 It would be renamed the Pacific Vocational Institute in 1978, and in 1986, would merge with the British Columbia Institute of Technology and remain a part of that institution to the present. 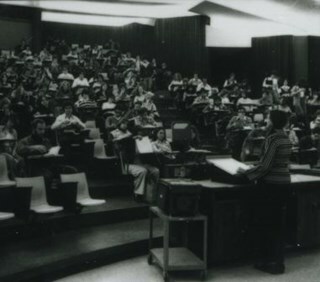 Photograph of students at Simon Fraser University sitting in study carrels and using tape players with headphones to do some "last-minute studying" for exams. Newspaper clipping attached to verso of photograph reads: "STUDY SESSION / Exams at SFU begin Saturday so most students are busy cramming. But in highly technological age they hit the tapes and not the books for last-minute studying." Photograph of Roy Styan making holographs at Simon Fraser University's physics department. Newspaper clipping attached to verso of photograph reads: "Roy Styan makes holographs at SFU physics department." Photograph of John Kuss, a computer expert and manager of educational services at Simon Fraser University's computer centre as he stands at a counter in the computer centre, smiling. 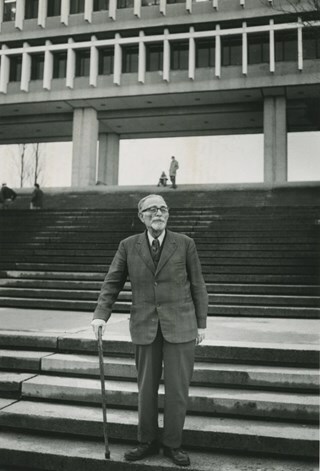 Photograph of, then eighty-two year old, Simon Fraser University student Stanley Morisse standing on the steps of the university. Already fluent in French, Italian, Turkish, Greek and English, he was in his second year of studying Russian at the Burnaby mountain campus when this photograph was taken. 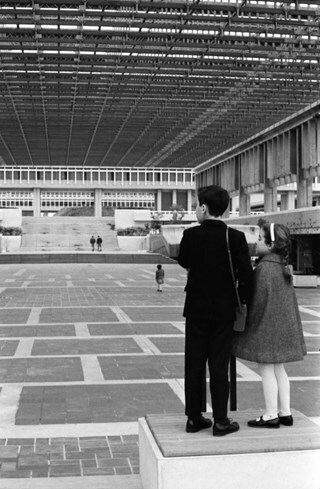 Photograph of Sean and Wendy Johnston standing in Convocation Mall at Simon Fraser University. 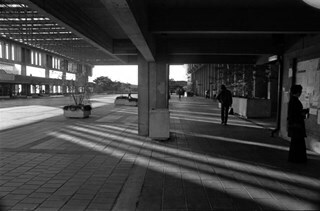 Photograph of Frances Johnston standing on an upper concourse at Simon Fraser University. The photograph was taken looking north-east and the academic quandrangle is visible in the background. 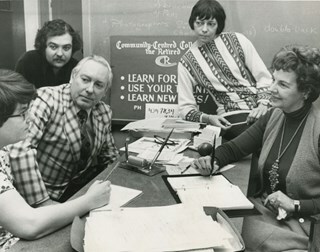 Photograph of Frances Johnston (far right) looking at a bulletin board outside the library at Simon Fraser University. 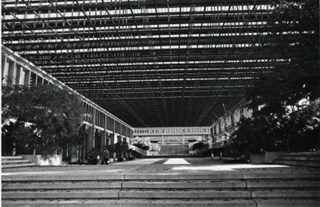 The photograph was taken looking west along Convocation Mall. Donated by the Burnaby Historical Society. Photograph of the unveiling presentation of the Canada Post "Exploration of Canada, Recognizers" stamp series at Simon Fraser University on March 17, 1988. Caption on original matte read: "Mayor Bill Copeland at the official ceremony of the new Canadian Stamps commemorating the early explorers, Simon Fraser, George Vancouver, A Henday & John Palliser. President Bill Saywell, Simon Fraser University, helps to unveil the series of "Exploration" Canadian stamps.". Title based on content of photograph. Photograph of one of the "Exploration of Canada, Recognizers" postage stamps unveiled at Simon Fraser University on March 17, 1988. The Canada Post stamp is entitled: "FRASER / RETURNING FROM THE PACIFIC / RETOUR DU PACIFIQUE" and the postage value of the stamp is 37 cents. Caption on original matte read: "The Simon Fraser stamp". Photograph of Burnaby Mayor Bill Copeland at the "Exploration of Canada, Recognizers" postage stamps unveiling at Simon Fraser University on March 17, 1988. Caption on original matte read: "Mayor Bill Copeland, S.F.U. student, and Kevin Conway (acting as Simon Fraser), and Mike Gormick, the General Manager for the Pacific Division of Canada Post, presenting gatefold albums.". There is also an unidentified woman in the photograph holding one of the gatefold albums. 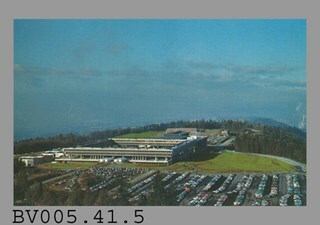 Photograph shows the covered mall at Simon Fraser University on Burnaby Mountain. The university, designed by architect Arthur Erikson was opened in 1965. The covered mall was completed a couple of years later. 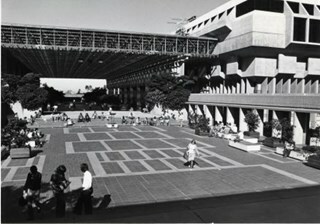 Photograph shows students lounging in the open mall at Simon Fraser University, with the Library on the right. 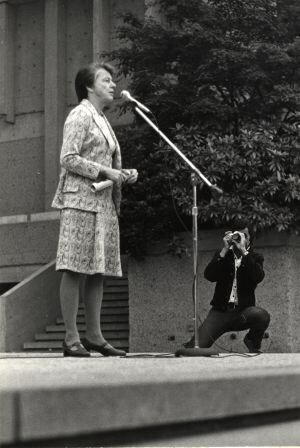 Photograph shows Pauline Jewett, President of Simon Fraser University, giving a speech to the students concerning the strike of clerical employees which was in progress at the time of this photograph. 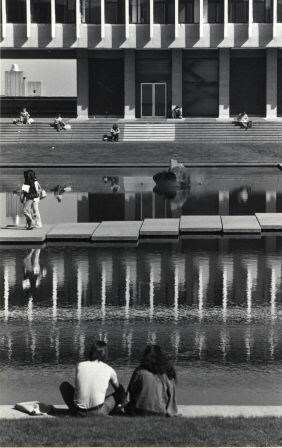 Photograph shows students sitting by the pool in the centre of the main academic quadrangle at Simon Fraser University on Burnaby Mountain. 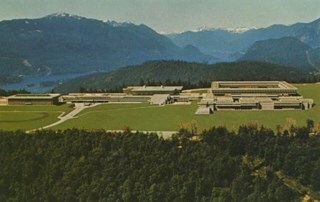 Photograph shows a classroom complex at Simon Fraser University, completed much later than the 1965 opening date of the University, with a view of the North Shore mountains in the background. 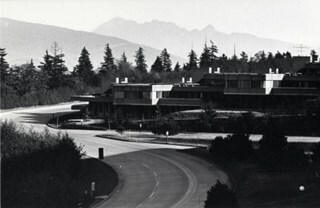 Photograph shows Shell House, the women's residence, at Simon Fraser University on Burnaby Mountain. This portion of the interview is about Dr. Ron Baker describing how the site for SFU was chosen. He talks about the study of driving times in the Macdonald report that suggested that Burnaby provided best access for the maximum number of students, the alternate sites considered for the university in New Westminster and Burnaby, and Reeve Alan Emmott’s role in choosing Burnaby Mountain. He also talks about the problem of isolation of SFU on Burnaby Mountain, and why out of the way places are often chosen for universities in BC. This portion of the interview is about Lee Rankin’s experience attending Simon Fraser University 1973-78, why he liked its physical environment and its treatment of mature students, and why its isolation is a drawback. He describes reasons why the site was chosen by Gordon Shrum and talks about the lack of documentation for the land transfer from City of Burnaby to the university and the results for their relationship. He also talks about why he went into law as a career. Recording is of an interview with Lee Rankin conducted by Kathy Bossort. Lee Rankin was one of 23 participants interviewed as part of the Community Heritage Commission’s Burnaby Mountain Oral History Project. The interview is mainly about Lee Rankin’s involvement in finding a resolution to the dispute between the City of Burnaby and Simon Fraser University over land ownership and control on Burnaby Mountain. He talks about the origin of the dispute, the positions taken by the two sides, the key people who brought about a resolution, and the main features of the agreement between the City, SFU and the province of BC. He talks about how the agreement met SFU’s goals, fostered trust between the City and university, and removed uncertainty from protecting parkland on Burnaby Mountain. Lee Rankin was born in 1953 in Vancouver. 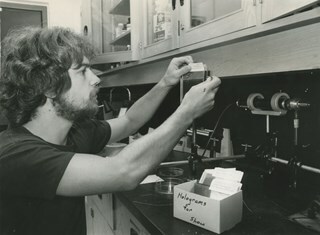 He attended SFU 1973-78, completing his BA degree in 1985. He earned his law degree at UBC in 1988, was called to the Bar in 1989, and practiced in immigration and refugee law. Lee has lived in Burnaby since 1976 and was a member of Burnaby Council for 22 years, from 1983-1999 and 2002-2008. His particular interests as a Councillor were in community planning, housing and environment. Among other duties and accomplishments as Councillor, Lee served as chair of the Simon Fraser Liaison Committee and was involved in the negotiations with the province and SFU that resulted in the university returning more than 800 acres of land to the City, which was dedicated as part of the Burnaby Mountain Conservation Area. He has also served on the GVRD, volunteers as a coach for team sports in Burnaby, and has served on numerous community and business associations and committees. Lee is married to Ragini Venkat Rankin and has one son Henry. 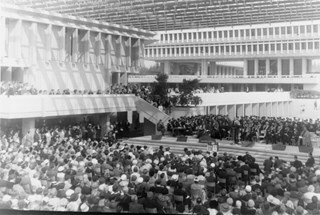 Photograph of the official opening of Simon Fraser University. A large group of spectators faces the stage from seats on the floor as well as the balcony. 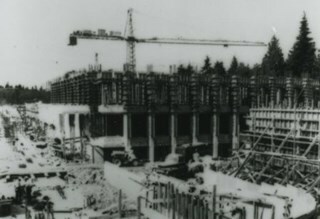 Photograph of a the construction of a Simon Fraser University (SFU) campus building. A crane can be seen in the background. 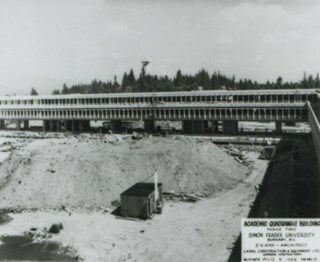 Photograph of the construction of the Simon Fraser University (SFU) Academic Quadrangle building, phase two. 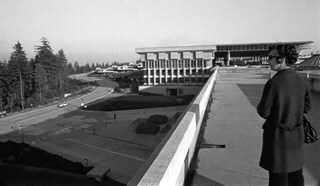 Information at lower right corner of photograph reads, "Academic Quadrangle Building / Phase Two / Simon Fraser University, Burnaby, BC / Z.S. Kiss - Architect / Laing Construction & Equipment Ltd, General Contractors / No14 Date Aug 5, 1966, Facing E."
Photograph of students in an English 101 class at Simon Fraser University (SFU). The professor standing at the front of the room and students are sitting in tiered seating. 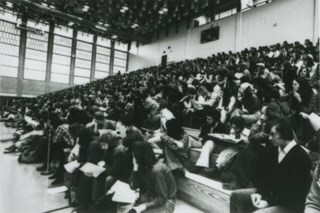 Photograph of students seated on bleachers in the Simon Fraser University (SFU) gymnasium. 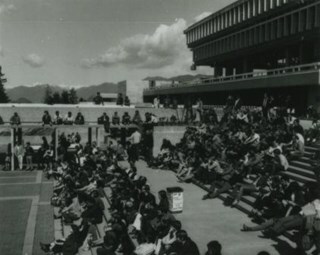 Photograph of students watching a student rock band at the outside mall at Simon Fraser University (SFU). Aerial photograph of the Simon Fraser University (SFU) campus. Photograph of the planning group for the official opening of the Community Centred College for the Retired. Seated around the table are; registrar Joanne Du Brall, consultant Darryl Adam, finance coordinator Owen Sheffield, resource coordinator Marion Haden and founder Mabel Dunham. Newspaper clipping attached to verso of photograph reads: "College official opening planned by registrar Joanne Du Brall, consultant Darryl Adam, finance co-ordinator Owen Sheffield, resource co-ordinator Marion Haden and founder Mabel Dunham. More than 500 seniors take advantage of non-profit institution." 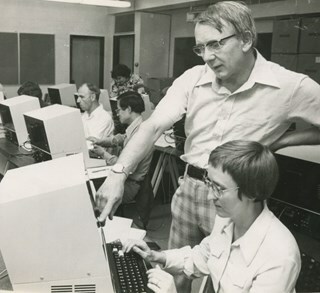 Photograph of Catherine Sheard, a teacher at Coquitlam's Banting Junior Secondary School at Simon Fraser University's first summer computer institute course. Looking over her shoulder as she works is Dr. Ronald Harrop who conceived the institute and teaches it with Dr. Margaret Benston (not in photograph). Newspaper clipping attached to verso of photograph reads: "SFU COURSE POPULAR / Catherine Sheard, a teacher at Coquitlam's Banting Jr. Sec. School is one of the 13 people enrolled in the teacher section of SFU's first summer computer institute course which has also attracted 19 high school students. 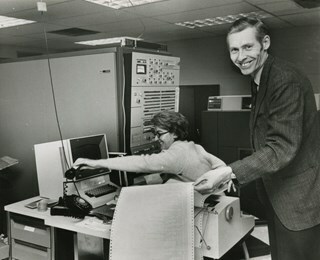 Looking over her shoulder as she works at a 'Widjet' computer machine is Dr. Ronald Harrop who conceived the institute and teaches it with Dr. Margaret Benston". This portion of the interview is about Basil Luksun and Jack Belhouse talking about Simon Fraser University and problems created by its isolated site on Burnaby Mountain. They talk about the building of the Burnaby Mountain Parkway, and tell stories about the cooperative planning between City and SFU staff for UniverCity. Recording is of an interview with Basil Luksun and Jack Belhouse conducted by Kathy Bossort. Basil Luksun and Jack Belhouse were two of 23 participants interviewed as part of the Community Heritage Commission’s Burnaby Mountain Oral History Project. The interview is mainly about the history of setting aside parkland by dedication on Burnaby Mountain, the 1974/76 delineation of the conservation area on Burnaby Mountain, and the dispute between Burnaby and Simon Fraser University over land ownership and control on Burnaby Mountain, as discussed by two retired participants in these events from the City of Burnaby’s Planning and Building Department, Basil Luksun and Jack Belhouse. They also talk about their interaction with the public in developing policies, particularly for the 1974 report “The Public Meetings - Phase One”, and the importance of a strong policy base for long range planning and the patience needed to assemble land for large parks. They talk as well about their careers, their close working relationship in the department, and the cooperation between City and SFU staff in the development of UniverCity. Basil Luksun was born and educated in South Africa, immigrating to Canada and Burnaby in 1972 to escape the harmful effects of apartheid. He holds a BSc degree from the University of Cape Town and a Post-Graduate Diploma in Town Planning from the University of Witwatersrand. He joined the City of Burnaby’s Planning and Building Department in 1973, working his way up through the organization to Director of the department before retiring after 39 years in 2012. When he started work in the 1970s, the City of Burnaby was focusing on green space planning projects and he takes great pride in these projects as well as the city’s focus on long-term planning. Basil lived in the Capital Hill area from 1972 to 1990. He currently resides in Vancouver and has two sons, Warren and Derek. Jack Belhouse was born in 1946 in Vancouver and attended UBC, York University and SFU (1965-1972), majoring in urban geography. He began working in Burnaby’s planning department as a summer student in 1968, and was offered a full-time position when he graduated from university. He became Director of the Planning and Building Department before retiring after 38 years with the city in 2006. He and Basil Luksun worked closely together in long range planning in the department. Jack lives in Coquitlam with his wife Linda and has two children, Brad and Lori. This portion of the interview is about Lee Rankin telling stories about various people, including Doug Drummond, the Barnet Rifle Range and Dr. Mauser, John Stubbs, and Jack Blaney. He also talks about the change in providing higher education from the full university experience to development of part time and online courses and satellite campuses. He tells about presenting an idea to Jack Blaney for a satellite campus at Metrotown. 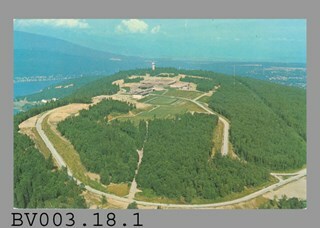 Aerial photographic postcard of Simon Fraser University and Burnaby Mountain. 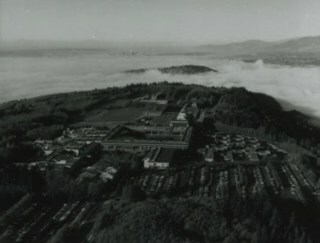 Aerial photographic postcard taken looking west over the parking lot and the Academic Quadrangle at Simon Fraser University. Photograph of apprentice senior program analyst Don Cowell standing at Simon Fraser University's computer center, holding a sheet of printout, as he smiles at the camera. A woman is sitting at the desk next to him, which holds the console typewriter, reaching to hang up the phone. She is also smiling. This is the "control unit" for the "first computerised on-line library loan system in Canada". 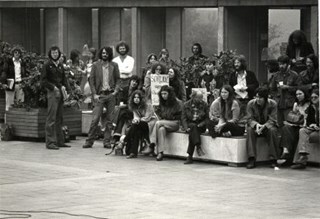 Photograph shows students in the mall at Simon Fraser University attending a rally about the strike of clerical workers at the university. Photograph shows benches and garbage in the mall at Simon Fraser University after the October 13th rally had ended. The rally was related to the strike of clerical employees at the university. This portion of the interview is about Sev Morin’s description of Burnaby’s growth and business development along Kingsway and Hastings, the Lake City Industrial Park, and the purchase of property in 1958 for the Heritage Park and Art Gallery. Recording is of an interview with Severin "Sev" Morin, conducted by Rod Fowler. Sev Morin was one of eleven participants interviewed as part of the SFU/Burnaby Centennial Committee's oral history series titled, "Voices of Burnaby". 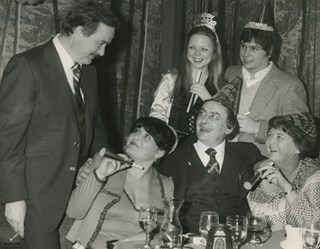 The interview is mainly about Sev Morin’s banquet hall, restaurant and night club business on Kingsway, originally named the “Gai Paree Supper Club” (1947-1976) and later “Severin’s” (1976-1985) and “Diego’s” (1985-1994), its function as a Burnaby landmark, and the entertainment and political people he met through his business. He also describes his many volunteer activities in Burnaby, including member of the SFU Senate, Rotary Club, Variety Club and Telethon, fund raising for Burnaby Hospital, and tourism related groups, and his political work for the federal Liberal party. He talks about his parents’ origins, the lives of his brothers Rudy and Rene, and the family’s involvement in establishing the “Gai Paree”. He also shares his views about the business and cultural development of Burnaby. To view “Narrow By” terms for each track expand this description and see “Notes”. Severin “Sev” Rene Morin was born September 21, 1927, in Bonneville, Alberta, to Rene Pierre Morin (1878-1963) and Anne Marie (nee Lachiver) Morin (1886-1956). Mr. and Mrs. R. P. Morin and their son Rene Francois (1905-1954) immigrated to Edmonton, Alberta, from France in 1913, where Rene Pierre Morin worked for the C.N.R. and a second son Adolphe “Rudy” Ferdinand (1922-1969) was born, followed by their third son Severin. In 1943, after R.P. Morin retired, the family moved to Burnaby to a house on Sperling Avenue. Sometime earlier the two older Morin brothers found work in Trail at the smelter and developed musical careers. In 1946/47 the Morin family purchased property on Kingsway and built a banquet hall, the “Gai Paree Supper Club”. Sev and Rudy Morin managed the club and Rene F. Morin moved to Burnaby to join them with his band. The supper club, with its live music and dance floor, became a popular meeting place and wedding venue, eventually expanding into a restaurant and nightclub in the 1970s. The “Gai Paree” was renamed “Severin’s” in 1976 and “Diego’s” in 1985, closing finally in 1994. Sev Morin’s business life included three record stores which he owned with his friend Jack Cullen. Through these businesses Sev Morin was well known in the entertainment and hospitality industry. He and his restaurant also hosted political and social events that made the restaurant a community landmark. Sev Morin contributed many volunteer hours to community and charitable organizations, including an appointment to the SFU Senate, fundraising for the Burnaby Hospital, Director of the Variety Club and Rotary Club, and consultant for a variety of tourism related ventures. He also was active in the federal Liberal Party. Sev Morin and his wife Pauline married in 1950 and had three children. Sev Morin died at age 86 on March 28, 2014. Rod Fowler returned to university as a mature student in the 1980s after working about twenty years in the field of economics and computerization in business in England, Europe and Western Canada. He graduated with a BA from SFU in both History and Sociology in 1987, his MA degree in Geography in 1989, and his PhD in Cultural Geography at SFU. He taught courses in Geography, Sociology, History and Canadian Studies at several Lower Mainland colleges, before becoming a full time member of the Geography Department at Kwantlen University College. Interviews were digitized in 2015 allowing them to be accessible on Heritage Burnaby. The digitization project was initiated by the Community Heritage Commission with support from City of Burnaby Council. Photographic postcard taken looking north towards Simon Fraser University. 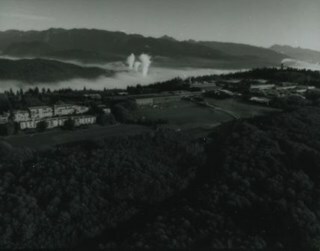 The caption on the back of the postcard reads: "The aerial view shows part of the university buildings on Burnaby Mountain, with Burrard Inlet, Indian Arm and the North Shore Mountains in the background."